What awaits Russia after Americans vote on November 8? 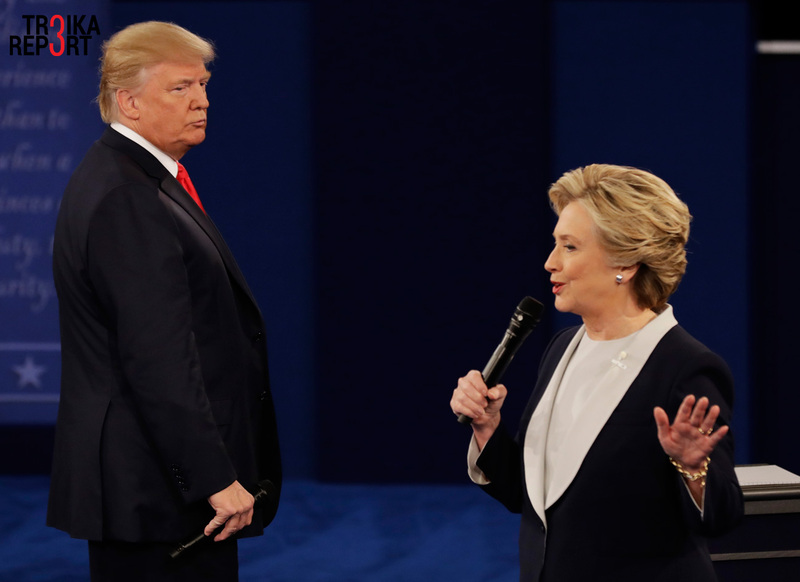 Republican presidential nominee Donald Trump listens to Democratic presidential nominee Hillary Clinton during the second presidential debate at Washington University in St. Louis. The political thriller in the U.S. has culminated in a plethora of forecasts about the future, depending on who moves into the White House. Academics from the U.S., Europe and Russia shared their views with RIR, revealing confusion, apprehension – and a little hope. With the United States going to the polls to vote for the successor to President Barack Obama, the “common wisdom” in the West that the Russian leadership has endorsed one candidate against another, and even attempted to use cyber attacks to influence voters, should be dismissed as a media gimmick to influence unsophisticated public opinion. What is true, however, is the genuine concern in Moscow over the extent to which the torrent of anti-Kremlin rhetoric will continue if Hillary Clinton assumes the presidency. A number of academic thinkers asserted that it would not matter, and that Moscow would be better off welcoming the Democratic choice due to her excellent credentials. Russia “needs someone who is predictable,” says Peter Kuznick, a professor from the Department of History at the American University, Washington, D.C. and director of the Nuclear Studies Institute. Unlike Clinton, “Trump could do anything. He talks about using nuclear weapons. So cavalierly. He doesn’t know what it is. (Nikita) Khrushchev said that when he was briefed about nuclear weapons in 1952, he could not sleep for days,” said Kuznick. The Professor, attending an international conference in Moscow on “Civil society, media and power,” was scathing in his criticism of the Republican nominee. “Trump is appealing to the worst instincts in American politics. He appeals to all backward tendencies. He also appeals to fear: The idea is that everybody is coming to get us. Blacks are dangerous. Immigrants are dangerous. Foreigners are dangerous. This is kind of an insular mentality, which in some way is close to fascism. There is nothing positive about his message,” said Kuznick. His analysis is disputed by some other analysts. “As for Trump, he’s got many handicaps but on security issues he talks like a businessman. This is mine, this is yours, and the rest is negotiable,” said Eduard Lozansky, a former Soviet dissident and now president of the American University in Moscow. He was speaking to RIR at the sixth Eurasian Forum in Verona, Italy, in October. “I’m saying this as an American patriot. The U.S. gave me refuge. The Soviet Union was bad to me; it separated me from my wife. I am grateful to the United States. That is why I am worried. If one country claims that it is ‘indispensable’ and knows better what is good for others, it antagonizes people,” said Lozansky. “Like many people, I regard Trump as very vulgar and brash, and he embodies all the worst aspects of American culture. But on a number of subjects, to me, Trump has been absolutely admirable,” he added. John Laughland, a right-wing British journalist and writer and director of Studies at the Institute of Democracy and Cooperation in Paris, defended Trump. Softening up in the Oval Office? However, Xavier Moreau, a French political analyst, told RIR that, in his view, a military conflict between Russia and the U.S. was unlikely. Will Russian interests get ‘Trump’ed? “No, I do not believe that Hillary Clinton would start the Third World War,” he said. “The United States is in a dismal economic situation with millions out of work; one out of every six Americans depends on food stamps just like during the last war; the total national debt is gigantic. These are the issues that Clinton will have to deal with in the first place,” he said. But it is not all doom and gloom. Prof. Kuznick, who is hardly an ardent admirer of Hillary Clinton, laid emphasis on the new balance of power within the Democratic camp. The final verdict? “There are many reasonable people who are going to pressure Hillary and move her to the left and away from a confrontational course [with Russia],” said Kuznick. “Trump should not be idealized,” said Elena Ponomareva, a professor at the Moscow State Institute of International Relations and president of the International Institute of the Development of Science Cooperation, also based in Moscow. Under Donald Trump as president, bilateral relations would be “complicated yet open vistas for agreements” given that U.S. industrial groups and even the military have a stake in making money through meaningful cooperation with Russia. There could be a third option too, added Ponomareva. “Since Hillary is both ill and ambitious, the United States might end up with the scenario of The Manchurian Candidate,” borrowing the metaphor from the 1959 novel by Richard Condon. Basically, this means that after a “black swan” emerges, a “grey horse” will become the number one actor. In this case, it would be Virginia Senator Tim Kaine. This is the great unknown, since no one knows the identity of the people behind him, said Ponomareva. The most intriguing aspect of what has been derogatorily termed the longest U.S. political soap opera, said academics approached by RIR, is that the political system, which is showing cracks in its credibility, may now see genuine reforms from within. “Neither the Democratic umbrella nor the Republican umbrella is working anymore,” said Professor Kuznick. “For a long time, there has been a cartel between left and right in Europe, as much as in America. This cartel is losing its grip, because people are increasingly dissatisfied with the cartel,” he says. The 2016 U.S. presidential elections have become a turning point in the evolution of Western democracy, with its deficiencies coming into the open and frustrating the electorate. Despite contrasting forecasts on what America will look like “the day after,” it is clear that whoever wins on November 8, the country will no longer be the same.